David, Sky, and I were hoping to ski Rainier (possibly via Fuhrer Finger) starting Tuesday or Wednesday this week, but the rapidly deteriorating forecast put that plan on hold. Late Monday night, I suggested we head south to look for better weather and some steep ski descents. The picturesque horn of Oregon's Mt Washington may not be very tall, but the Northwest Bowl has a reputation for being an excellent ski descent. We left Seattle at 5 am Tuesday, with less than an hour of sleep for me (spent too much time posting previous TRs to T-A-Y!). We drove through occasional drizzle and stopped for breakfast in Portland after fighting through a big traffic jam. Turning off of I-5 at Salem towards Santiam Pass, we soon saw sunbreaks and finally broke out into clear skies just east of Detroit Lake. We reached Big Lake and the first magnificent views of Mt Washington by 11 am. I was unsure what trailhead offered the shortest access (we looked at Big Lake West / Patjens Lake TH), but we finally parked just outside the Big Lake Boys Camp at 4700 ft, about 1 mile south of the standard PCT trailhead. Mosquitoes immediately attacked us in droves. By noon we were bushwhacking through the open woods heading SE, with occasional snowpatches, and soon ran into the PCT, following it south. With the numerous deepening snowbanks, we missed the turnoff for the climbers' trail and went too far south, finally turning east and bushwhacking into the southern part of the Northwest Bowl. Here the forest opened up and the route ahead was clear. We booted directly up the steep face of the bowl, following an occasional bootpack, and reached the saddle at 7450 ft on the North Ridge by 4 pm. The upper part of the main bowl reached 50 degrees, and the last few hundred feet of snow below the ridge were connected to the main bowl by a short but steep and narrow snow finger (6 ft minimum width, 50+ degrees). The saddle is the start of the standard climbing route on Mt Washington, and Sky free-soloed the 5.1 route to the 7794 ft summit in about 1/2 hour round trip, while David and I chilled out and readied for the ski descent. The small snowfield from the saddle to the snow finger was still well frozen with its northerly aspect even at 4:30 pm, and as I sideslipped through the narrowest part of the finger the rocks just cleared the tips and tails of my 185 cm skis. But just below that point, the main part of the Northwest Bowl was sweet perfection. We zipped down on 1-2 inches of corn above a firm base, arcing huge turns down to the flats about 1000 vft below. By following the correct northern drainage out of the bowl, we skied continuous snow down to 5600 ft. We could have skied a couple hundred more vert with some short carries, but we put the skis on the packs and soon ran into the climbers' trail and connected easily with the PCT. Two of us found the correct turnoff from the PCT which led easily straight to the Big Lake Boys Camp, while the third fell behind, took a left turn, and hiked nearly around Big Lake before backtracking and very tardily reaching the car. Not a bad day of skiing considering that we started from the car at noon, and had left Seattle under very inauspicious skies. 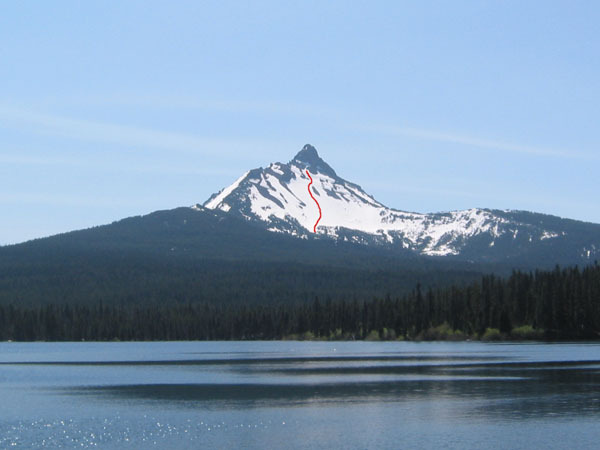 The Northwest Bowl of Mt Washington from Big Lake, with the middle portion of our ski descent shown in red. The upper portion of our route followed the narrow snow finger above the red line, and then the leftward angling snowfield to the North Ridge (see the larger photo). The lower portion of the ski route is down in the woods.